The Blob Test is a test developed by British behavioural psychologist, Pip Wilson. 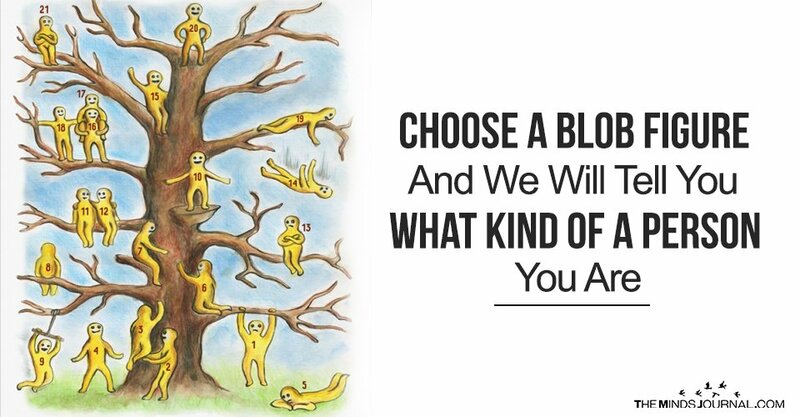 It is called the blob tree test and is inspired from the theories he puts forth in his book the Big Book of Blob Trees, where the author uses 50 different blob trees, characters and scenarios to explore feelings , understand hidden emotions that individuals or groups may experience personally. As you can see, there are figures with various facial expressions sitting on/trying to sit on/climbing/lying around the tree. Each of this describes a certain mood and a certain activity. First of all, take a good look at the tree and its denizens; then choose one. Not randomly. The figure whose mood/activity resembles you the most; or you think resembles you the most. The figure you would want to resemble; that is be like. Your choices will reveal facts about your psycho-emotional state. If you have chosen figures 1, 3, 6, or 7 then you’re a resolute person, not afraid of difficulties or obstacles. You aren’t afraid of labour either. 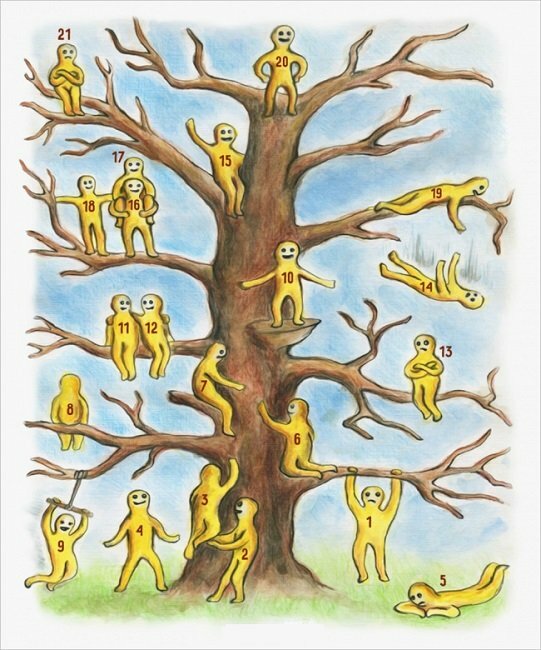 If you feel that one of the figures 2, 11, 12, 18, or 19 resembles you, then you’re an amiable person who is always there when your friends need you. Your social skills make you the confidante of your group, the one people rush to for advice and hugs. The choice of figure 4 describes you as a steadfast person, who wants to achieve success without the hassle of overcoming hardships. You might want to work on that. The path to success is never free of thorns. Number 5 means you’re often weary and feel weak, and you have little energy for life. You might want to do things you loved in the past; re-ignite old passions and hobbies or try to learn a new skill and you will be fine. If you’ve chosen figure 9, you’re a merry and fun-loving person. A true epicurean, you love good food and the finer wines and like the company of people. Choosing numbers 13 or 21 means that you’ve got the tendency to keep to yourself, you’re also frequently anxious and would normally avoid other people. Do things that have calmed you down in situations like these, before. Try and avoid stressful situations, but also try to seek someone with whom you are comfortable talking to. Figure 8 says that you’re a real daydreamer — you like being in your own world and away from this one. Your imaginative streak makes you well-sought for all kinds of group endeavours. Picking number 14 signifies that you’re emotionally drained or exhausted and in need of mental/spiritual rejuvenation. There is a good chance you’re facing inner emotional crisis or turmoil. Try to talk about your problems with your friends/family/loved ones. Communicating is key to things like these.